Sonic the Comic (STC) was a Sega and Sonic the Hedgehog-themed comic published by Fleetway Editions in the United Kingdom. Beginning at the height of Sega's popularity in 1993, it continued fortnightly until early 2002, spanning 223 editions and a number of specials. Sonic the Comic is an entirely separate publication from the ongoing Archie comics series, which began in the US just two months after STC. Sonic the Comic debuted in May 1993 under the guise as the "UK's official Sega comic", capitalising primarily on the success of the Sega Mega Drive, Sonic the Hedgehog (and its sequels), and the vibrant Sega culture that had swept across the UK at the time. It was originally priced at 95p, with the price rising to £1.35 before the final issue. The idea of Sonic the Comic was that an issue would typically host four Sega themed comics (occasionally just one split into four, such as in issue #100), interspersed by regular editorial segments. In the early days STC doubled up as a Sega-themed magazine, providing video game news, reviews and tips, but over time these segments were dropped, usually leaving just "Control Zone" (an overview of the issue), "Speedlines" (a response to fan letters) and "Graphic Zone" (a showcase for Sega/Sonic fan art). Robotnik's first form, before adopting a design akin to Adventures of Sonic the Hedgehog. The face of the comic was "Megadroid", a cartoon robot built out of Mega Drive parts, who answered letters and acted as a liaison between the readers and the 'humes who think they're in charge'. As well as covering Sonic, early editions of the comic also featured segments for Shinobi, Streets of Rage, Kid Chameleon, Eternal Champions, Golden Axe and Decap Attack. Of all these, only Decap Attack survived into the latter half of the 1990s due to its unexpected popularity, however it too was later pulled, with the slots instead devoted to Sonic (and friends). A declining audience towards the end of the decade saw significant cutbacks in STC. Executives at Egmont/Fleetway, believing that the audience would be refreshed every five years, forced the comic to repeat earlier stories, which in turn led to a further shedding of customers. This practise began as just one of the four segments, then two, then three, and, after issue #184, all the comic's content, besides the cover art, advertising and editorials, were lifted from earlier editions. Sonic the Comic was officially discontinued in early 2002, after 223 issues. For most of its lifespan the frontrunner of the comic was Nigel Kitching. Less successful variants of Sonic the Comic were produced for other parts of Europe; Sonic Mag: B.D. & Jeux-Video! in France, Sonic der Comic in Germany, Sonic Videogame & Fumetti in Italy and Sonic Magazine in the Netherlands. Sonic the Comic's adaptation of the Sonic the Hedgehog franchise was the dominant force behind the comic from the beginning and was supported with new stories for 184 of the 223 issues. It is primarily based on the approved Western story of Sonic, seen in the US as a promotional comic in the second half of 1991. Super Sonic kills people in STC. Or at least tries to. 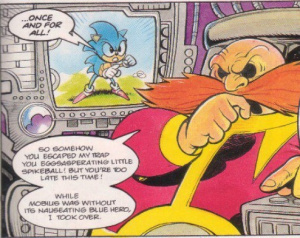 The series was placed after the events of Sonic the Hedgehog 2, with a triumphant Sonic and his buddy Miles "Tails" Prower assuming nemesis Dr. Ivo Robotnik has been defeated. Having accidentally been trapped in the Special Zone for six months, Robotnik takes control of the planet Mobius, begins to turn the population into badniks, and the hedgehog and his motley crew of freedom fighters are tasked with unseating the evil dictator and restoring peace to the planet. Captain Plunder became a fan favourite. 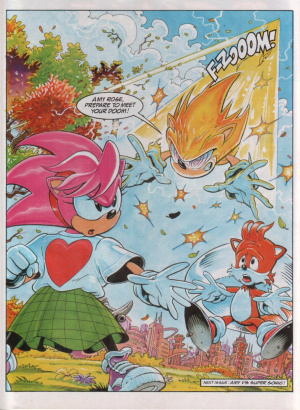 Unlike its American counterpart, Sonic the Comic is said to have kept closer to Sega's original Westernised ideas for the franchise, though still deviated from any official canon at the get go. Though much of the plot was original, STC adapted many of Sonic's games of the 1990s, including Sonic the Hedgehog 3, Sonic & Knuckles, Sonic CD, Chaotix, Sonic 3D: Flickies' Island and Sonic Adventure, attempting to keep the stories as true to the games as possible. The comic did add some characters of its own, however, including key characters such as Johnny Lightfoot and Porker Lewis, based on the rabbit and pig animal buddies respectively. Early on the comic introduced Captain Plunder and his Mystic Cave pirates, with the genius Tekno the Canary later being introduced, along with Shortfuse the Cybernik. A number of original enemies were also created for the comic, chief among those including the pathologically loyal Grimer, who stayed at Robotnik's side, and the Drakon Empire. 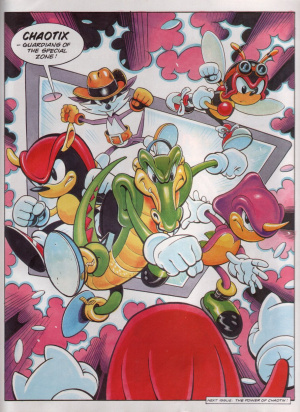 Significant deviations from the official canon include the Chaotix Crew, consisting not only of Vector the Crocodile, Espio the Chameleon and Charmy Bee ("Charmee" in this context), but also of Mighty the Armadillo (who is but a "traveller" in the Japanese version) and originally, Nack the Weasel. Under stress, Sonic would transform into Super Sonic, a destructive creature made of pure chaos energy. 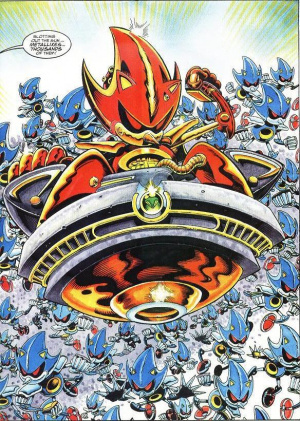 The Metal Sonic design, named here as "Metallix", would go rogue and create the Brotherhood of Metallix, threatening both Sonic and Robotnik, and the Chaos story is almost entirely different from what is witnessed in Sonic Adventure. Sonic the Comic remains a popular comic among Sonic fans, to the point where following cancellation, an online continuation (appropriately titled "Sonic the Comic Online") with the backing of Nigel Kitching was launched, and continues to this day. While building on STC as a base, the online edition attempts to bridge gaps between this fictional universe and those seen in more recent Sonic games, starting with Sonic Adventure 2. This page was last edited on 18 March 2019, at 22:45.